The last week saw me disappear from the blogosphere and I seem to have missed out a lot of action and lot of mouth watering recipes too. I guess it is going to take me a lot of time to browse through all of them. In all this confusion, I had also forgotten about the Blog Hop Wednesdays started by Radhika. So yesterday, I hopped onto Swetha's space and was utterly confused at the mouth watering recipes. I finally settled in for this easy-peasy muesli which was on my to-do list for a long time. I had many granola recipes in mind with different combinations of ingredients but all of them were to be baked in the oven. Now that was surely going to take up a lot of my time which is a scarce commodity these days. But when I realized that this particular recipe was made in the microwave, I made it right away and was very much pleased with the result. My husband has asked me to make a bigger batch of this so he could take it to his work place and have this for a snack :). In spite of so many interesting (read healthy) ingredients in it, I am happy to get such a compliment from him. In a microwave safe bowl (I used a glass bowl) add the grated apple and cook for a minute or until the apple becomes mushy. Add agave nectar, salt, cinnamon and nutmeg powders and gently mix them. Cook the mixture until it boils. It me about 2 minutes. Meanwhile in another mixing bowl, add the oats, coconut, wheat germ, sun flower seeds, flax seeds, sesame seeds and the mixed nuts. Mix them well and transfer them into the apple mixture. Mix well until the oats mixture is well coated with the apple mixture. The resultant mixture should resemble bread crumbs. Evenly spread in a microwave safe bowl, and cook in 1 minute increments until the mixture turns golden brown and gets a crisp texture. It took me about 6-7 minutes. Let it cool and store in an air tight container. It is recommended that you store it in the refrigerator because of the addition of apple. Serve it as breakfast with milk or eat it as is like a mid-day snack like we do !! Welcome Monday!! It had been a hectic and tough time for us with the older one admitted to the hospital with some mysterious belly ache which saw us running to the Emergency twice in 3 days. We are so glad the past week is behind us. Fortunately for us, we are all back to our routine with nothing to worry about the kiddo. She is all smiles and back to school !! Now on to some pleasant things in life. Some comfort food.. I have been relying on this one pot meal for quite sometime now for a quick fix lunch/dinner for me and the kids. S is not a great fan of quinoa so he is excluded from the list! I have tried various proportions of quinoa and moong dal and found no great difference in texture or taste. Note - I add some vegetables for variation sometimes. I throw in some rice too if the kids are fussy. So play around with the ingredients to suit your tastes! In a heated pan, add 1/2 tablespoon of ghee and fry the cashews and the pepper corns. In the same mix add moong dal and fry till the moong dal gives out a nice aroma and the color changes slightly. Wash quinoa separately and add turmeric, hing, jeera, salt and about 3-4 cups of water. To this add the fried moong dal mix. I put it in a pressure cooker and it was ready in 19 min. Note - Optionally a seasoning of mustard seeds and curry leaves (in loads of ghee!) can be added in the end. Serve hot with Bendakaya Gojju or Chutney of your choice. 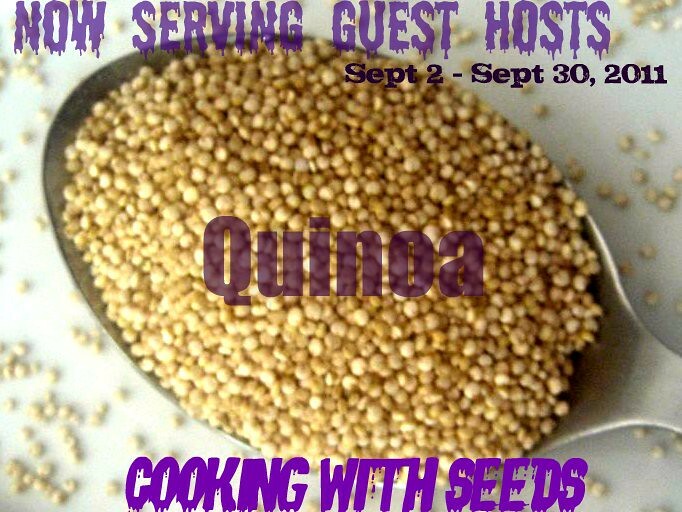 Sending this to 'Cooking With Seeds - Quinoa' guest hosted by Priya of Now Serving originally started by Priya Suresh. I wish I had baked a mango cake in summer when I had fresh mangoes on hand. But nothing to worry when we have the condensed mango pulp available all year round! So the other day when I had this urge to bake a mango cake, I went ahead and used up some mango pulp from my refrigerator and baked this delectable 'mangoey' cake. Inspiration for this cake comes from here. Please note that the cake was slightly less sweet as I intended. So feel free to either adjust the mango pulp or add more sugar to make this cake a little sweeter. Also it can be made fat free by omitting the oil/ghee component and I bet it wouldn't alter the taste too much as I found when I baked Fat Free Eggless Mango-Cranberry Muffins. In a mixing bowl, whisk all the dry ingredients and set aside. Add 3 tablespoons of water to the flax seed meal and set aside. In a blender, blend all the wet ingredients (including the flax seed meal soaked in water). Mix the wet and dry ingredients gently until combined to make a lump free batter. Do not over mix. Fold in the walnut bits gently. In a greased and floured cake pan (I used 8 X 6 X 2 rectangular dish), pour the batter and bake until a tooth pick comes out clean. My cake was done in 43 min. Let it cool in the cake pan for 10 min and run a knife along the edges to make sure the cake doesn't stick to the pan. Invert it onto a cooling rack and let it cool further before slicing. Slice as required and serve it with jam or jelly if you have a sweeter tooth. After skipping last month's challenge I was almost about to skip this month's Jalebi Challenge too, thrown by Srivalli as part of the Indian Cooking Challenge. After dilly-dallying for more than 20 days I finally made them the other day with lot of apprehensions. I set aside my resolve to abstain from eating sugary stuff just for these cuties!! They turned out near perfect - crispy on the outside and juicy on the inside. But wait a second, they lost their crispiness after a couple of hours. Maybe a little more cornstarch and from what I gather from fellow bloggers, slightly thicker consistency of the batter might make things better. That is for the next time though. But watch out as they quickly dissolve into your mouth and disappear from the plate. My little one asked me if they were 'sweet pretzels' :). I was amused at her association of these jalebis with pretzels. Can't blame her, can I ?? Note that in many sweet shops jaggery syrup is used instead of sugar syrup taking it to another level and very filling one at that!! Mix Maida, cornstarch, curds, lemon juice and hot oil into a thick lump-free batter. Beat the batter for a couple of minutes to incorporate some air in it. Note that the batter I made was of pancake batter consistency. Pour the batter into a piping bag, thick plastic cone with a small slit at the tip or a ketchup bottle. The slit I made was just about size of a pepper corn. Now is the time to get the sugar syrup going. Boil the sugar and water until a single thread consistency is achieved and remove from fire. Squeeze in some lemon juice to avoid crystallization of the syrup. Make sure the syrup is always warm until the last jalebi is done. Heat the oil in medium flame, when it is smoking hot, reduce to a low flame. Dunk them into the syrup for about 30 seconds and remove them with a skewer or a fork to a serving dish. Serve them warm / hot and savor the delicious Jalebis!! This time for the Blog Hop Wednesday Series I have chosen Bottle Gourd juice which is an ideal one for weight watchers. I have been paired with Raksha this time around. This juice recipe reminded me of the usefulness of Bottle Gourd. I am aware of this juice being prescribed by Nature Cure Clinics as part of body cleansing and detoxification. I have been thinking of making this juice for myself since a long time and thanks to Blog Hop, I finally could make it and enjoy every drop of it!! 1. Bottle Gourd plays an important role in the Indian Ayurvedic System. 2. Its nutritional profile is exceptional. 96.1% of the vegetable is just water thereby an ideal thirst quencher !! 3. It is helpful in the cure of urinary disorders and also good for diabetics. 4. It is supposedly easy on the stomach too. 5. It is also good for the eyes. For more ideas how to consume Bottle Gourd check .. Blend the bottle gourd and tomato until there are no lumps adding as much water as needed. I added about 1/4 cup of water. Mix in black salt, pepper powder and jeera powder. Please don't strain the juice and discard the pulp as the pulp is full of fiber ! Drink it fresh without refrigerating and allow the goodness of Bottle Gourd seep into your system !! Also Make sure you hop onto our fellow blog hoppers. My husband can't resist fresh looking vegetables in the market and he probably thinks they would retain their freshness for weeks :). So when he gets a truckload of bell peppers of different colors just because they were looking fresh, what am I to do? I could not accommodate so many veggies in the already loaded refrigerator. So I had to change my plans for dinner and this curry in the typical South Indian way appeared on the dinner table. I didn't add ginger and garlic, but feel free to add if preferred. I have to note here for my future reference that the ginger and garlic were not missed and the kids liked this as I had made it a little milder. In a heated sauce pan, add 1 tsp oil and saute onions until they are golden brown.Make a fine paste of the roasted sesame seeds, peanuts, cashews, coconut powder, red chillies, coriander leaves, sauteed onions and half of the chopped tomatoes. Clean the sauce pan and heat the remaining oil. Add the seasoning ingredients and after they are brown and transfer the fine paste. Feel free to add required water and let it boil until the oil oozes out. Add the turmeric, chopped capsicum and cubed potatoes, cover and let them cook. While it is cooking, make a powder of cloves, cinnamon and cardamom in a mortar and pestle (or spice grinder). Add it to the simmering veggies. Also add in the jeera powder. Add salt as per taste tamarind juice and or amchur powder to taste. Let it simmer until the veggies are cooked through. Remove from fire and garnish with coriander leaves. Serve with Roti/Naan/Rice and enjoy! Also I had some candied fruit which I felt was not even close to the tutti frutti we get back home in India. But nevertheless the candied fruit enhanced the taste of this bread/cake. To my delight the cake was very much liked by the kids without any adverse comments. I was happy that my older one didn't 'smell' the bananas and gladly dug into her share of the cake!!! Preheat the oven to 350 F and keep a 7 X 3 X 2 1/2 loaf pan ready either by greasing it or lining it with parchment paper. In a mixing bowl, whisk the flours, baking powder and set aside 2 tablespoons of flour. Roll the tutti frutti and raisins in the 2 tablespoons of flour set aside. Blend the bananas, oil, sugar, milk and apple cider to make about 2 cups of liquid. Mix the flours and the wet ingredients so there are no lumps. Fold in the flour rolled tutti frutti into the batter. Transfer the batter into the prepared pan, sprinkle some tutti frutti on the top and place it in the center rack of the preheated oven. Bake for about 50-55 min until the tester inserted comes out clean. I took out mine at 57 min. Let it cool in the pan for 10 min and run a knife through the edges to loosen the cake and carefully remove it from the pan onto a wire rack for further cooling. Slice upon cooling and devour! Typically Hot and Sour Soup has its origins in the Asian cuisine. It is usually spicy and sour. I later came to know that the sourness was because of vinegar and spice was from chilli sauce. I remember having tasted this kind of a soup in some vegan restaurant few years ago. I remember that the soup was watery and had lots of vegetables and tofu, was tangy and spicy too. After reading through some recipes and I came up with this combination which truly warmed us on a rainy and muggy evening! Inspiration came from S who reminded me of this soup and as a natural instinct I added cornstarch to slightly thicken the soup. I have prepared this soup a few times now and I have come to understand that the chilli sauce must be used judiciously. The first time I made this soup, it was way too spicy for me while S had a field time slurping the soup all for himself. So the next time I prepared I made sure I reduced the chilli sauce which saw me finishing the soup faster !! Note - I have learnt that consuming Apple Cider Vinegar in a diluted form is recommended in some weight-loss clinics. In a heated sauce pan, pour the vegetable stock (or just plain water) adding soy sauce, chilli sauce and vinegar. Add all the vegetables and let them cook al dente. Make sure they retain the bite and are not soft and mushy! It would approximately take about 10-12 minutes. Sprinkle in the required salt, pepper, ginger, sugar and simmer. In a small bowl, add cornstarch to 5 tablespoons of water to make a lump free paste and add this paste to the simmering soup while continuously stirring to avoid lumps in the soup. Remove from fire and garnish with chopped spring onions. I had to make do with coriander leaves this time around!! For all the 'Chole' lovers out there, here is yet another delectable protein source to boast!! The flavor of the spices together with Paneer (Indian Cottage cheese) is just going to blow your mind away. When I saw this recipe in Raghavan Iyer's 660 Curries I was drawn to it. When I posted Balti Masala a few days back, I am sure many of you were expecting some flavorful curry using that masala. So here it is..
Heat oil in a sauce pan over medium-high heat. Add cumin seeds and after they brown, add the onions and chillies (if using). Stir fry the onions until they get a light brown hue. Stir in the tomatoes, salt, Balti Masala and turmeric. Cook for a couple minutes until the tomato softens. Add the chickpeas and 1 cup of water. After the curry boils, reduce the heat, cover the pan and simmer, stirring continuously until the sauce thickens slightly for about 10 min. Fold in the Paneer and the Cream and let it simmer for a couple min more. Remove from heat, sprinkle chopped cilantro and serve with Roti/Naan/Rice/Pulao. Sending this to 'MLLA 39' happening at 'Whatwouldcathyeat' initiated by Susan. We, like most South Indians are very dependent on buttermilk. I for one cannot imagine a meal complete without curds or buttermilk. The ever popular 'coolant' is as humble as it can be. Most of you might know that buttermilk can be transformed into many delicious dishes. The most popular one is the Majjiga Pulusu (Kadhi). Buttermilk is often used to make many breakfast recipes, snacks and also used in baking. But here it is just spiced up and mixed in rice to be part of a hearty meal!! I understand that there are multiple recipes for majjiga charu and each region has a different name to this recipe. This is how my mom makes and we love it!! Powder the putana/roasted gram/putnala pappu into a fine powder. Grind ginger, green chillies, coriander leaves and coconut. Set aside. Blend the roasted gram powder, the above said ginger mixture and 1/2 cup of buttermilk so that there are no lumps. Transfer the above contents into a mixing bowl and add the remaining buttermilk, salt and turmeric. If needed add a little sugar and check for the taste. In a heated sauce pan, add oil and the remaining seasoning ingredients. After the mustard seeds pop and the rest of the dals brown, remove from fire and add this seasoning to the buttermilk mixture. Serve this spiced buttermilk with Rice or Pulao / Biryani or if it is mildly spiced, just gulp it down! !